Positive Home Entertainment is a Design Build Firm specializing in Custom, Luxury, High Performance Private Home Theater Rooms. Our focus is to Design, Engineer, and Build your one of kind private Home Theater or Media Room, to deliver one of a kind, sensational, and unique experiences for our Clients. We offer Custom Hand Drawn or Virtual CAD Drawings, so you are able to experience the look and feel of your room before its built. Whether you want to create a Fantasy Theater, a Simple Media Room with a unique theme, or just stick with a Traditional look and feel, we can help you achieve it. We will work closely with you to help you build the Room and System of your dreams. Our passion is taking a blank canvas and working with you to create a one off work of art that you can enjoy for years to come. We specialize in Design, Full Build Out of your Room, Acoustics, Engineering, and Calibration of both Audio and Video. If you are going to build a Custom Home Theater, there are many things to think about. It all starts with the size of the room, size of Speakers, size of Screen/Projector, Viewing Distance, Acoustic Characteristics of the room, Lighting, and Control. We do all the math for you to ensure that you get the very best you deserve out of the design of the room. Each room needs to be treated with the proper reflection and absorption for your Speakers to perform properly. We will engineer the properties of the room to give you the best picture and sound quality for your budget. We also specialize in Full Home Automation/Smart Home Integration. There is no project too small or too big for Positive Home Entertainment. With over 25+ Years of experience, we can easily take on any project you have. Please take a look at our Gallery here on Houzz, as well as visit us on YouTube, Facebook, and our Website for more information on what we can do to work with you on creating the Home System of your dreams. At A's Smart Home Solutions we collectively work with the best installers and brands to change & elevate your space to the next level. Founded by home technology specialist Omar Alarcon in 2014, the A's Smart Home Solutions is one of the first companies to specialize in Home Technology and Custom Audio Video Solutions that is respected by Custom builders and clients in Arizona. From the latest 4K TV's to Home Cinema, you can enjoy limitless entertainment and control it all from one simple remote or touch screen-right at your fingertips to provide you an incredible entertainment experience. Bryan comes from a multi-generational family of innovators in master planning, building and development. He uses his natural inclination for custom building design and electronics to provide clients with elegant, functional solutions to their home integration needs. Bryan is an expert in the field of custom audio video installation as well as lighting design, security systems and wireless technology. He has 20 plus years of professional experience. Bryan also enjoys the outdoors, skiing, camping and ATVs. Kimberlee has backgrounds in both communication studies and marketing. She has worked in the home integration industry since 2007, following her father’s electronics career in her position as operations controller at Watt Integration, managing all aspects of business and policy. She shares business partner and husbands Bryan’s interest in the outdoors and is an avid horsewoman. For over a decade, Watt Integration has provided custom residential and commercial automation, integration and design services. Our team designs and installs lighting, shade and home entertainment systems that can be operated independently or as a part of a whole home automated system. Large or small, modest or upscale, our trained and highly skilled team will design the solutions best fitted to your needs. Contact Watt Integration to talk about your home integration system needs and let us tailor a personalized plan for you. Our reliable team can provide you with high-quality solutions efficiently and affordably. Our goal is to transform your room in a way that both meets your needs and reflects your own unique style. Nexus 21 is the leader in stealth entertainment technology in motion. From television pop-up and drop-down lifts, to projector and storage concealment mechanisms, to motorized wall mounts, we break down the barriers of conventional design and room orientation with covert integrations for any space. 24/7 Audio Video specializes in Control4 home automation, home theater systems, outdoor audio systems, and home networking (WiFi). The Owner, Rob Arend, knows that the customer experience is everything, and strives to provide each customer with superb service now and into the future. Since 1998, 24/7 Audio Video's team has provided a personable & dedicated customer experience. The name speaks for itself- 24/7 Audio Video is always ready to take your call. An inconvenience may come at all hours, so why not call on the company who can handle it right away? 24/7 Audio Video is not just a service, it's a solution. 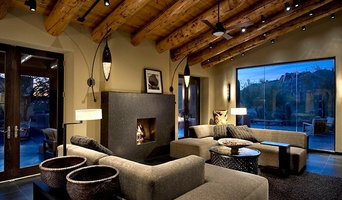 We specialize in Customizing Home Automation, Media Rooms, Home Theaters using the very best products in the industry. Design and installation of CUSTOM indoor golf simulators, launch monitors, Man Caves and She Sheds. We work closely with a wide range of clients from private residences, to corporate office, retail environments and country clubs to match the right home golf solution and technology to their needs and space – blending the best of both worlds. Simulators can also function as home theatres! 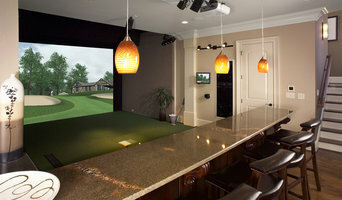 You can even watch a movie or the big game on one screen while you're playing golf, soccer or racing on another screen. We design and show you a 3D rendering of your completed space before we begin construction. We represent most manufacturers to provide you with the best simulation for you needs. Ai is a Smart Home Automation and Audiovisual company. We feature everything from home theaters to lighting control and automated shades. We also offer state of the art security and surveillance systems and can even monitor your security system for you. We are your one stop shop for all things technology and smart for your home. Thunderbird Custom Design is a media wall company in Phoenix, AZ. Our goal is to transform your room in a way that both meets your needs and reflects your own unique style. Our media walls combine drywall, wood and stone to create a decorative and functional space to store your audio/video equipment and display your artwork and decorations. A drywall entertainment center offers an unlimited number of design options not available in a typical wood entertainment center. This ensures that each home media wall is one of a kind. Call today for your FREE MEDIA WALL DESIGN CONSULTATION! Automated Environments provides complete custom electronic solutions for your home and business. For 20+ years we have delivered proven systems, superior products, and outstanding service. We are your partner in designing and implementing technology solutions in your setting. We provide automation control systems, access control, security, thermostat control, lighting control, motorized shades/drapes, cameras, Integration with irrigation and pool systems, alarm monitoring, programming, and system integration to make everything work seamlessly. Give us a call and allow us to help you achieve your desired outcome. The ProView Audio Video Experience offers residential technology solutions that make your life much more enjoyable. In early 2009 I, Jesse Silva, saw the need for easier-to-use yet more robust solutions for your home. I set out to find best solutions from the best manufacturers in smart home automation, whole-home audio, custom home theater, surround sound, 4K Ultra HDTVs, lighting control and climate control. Every year we spend hours researching, learning and training in the latest technologies and practices to ensure quality end to end. We want to ensure you feel confident that you will get the best solutions, honest pricing and customer service second to non. 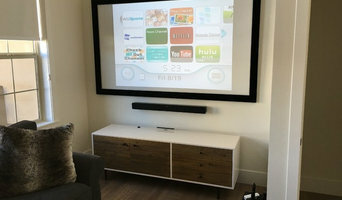 Smart AV Development Group is a custom integration company that specializes in home entertainment and automation systems, as well as commercial solutions. Whether you need a single-room home theatre or whole home A/V distribution with automation, we can configure any customized solution tailored to your unique lifestyle. 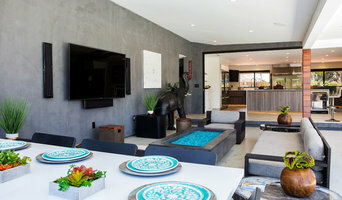 We work with commercial and residential clients and contractors in both Southern California and Arizona and specialize in creating smart home systems and custom theaters that bring together smart electronics, audio, smart lighting and shades, security cameras, access controls, and HVAC specifically tailored to our client's needs. Smart AV Development Group is a Bang & Olufson pro partner and specializes in voice integration. With the touch of a button, you can turn on your television, play your favorite movie, set the temperature to your liking and dim your lights just like a movie theatre. That’s just one of the ways home automation can simplify your life and consolidate your everyday activities into a turn-key solution. Our mission is to provide your household with an automated solution that will provide comfort, entertainment, efficiency & safety. All while making everything aesthetically pleasing in a custom form factor tailored to your lifestyle. Smart AV Development Group is your total smart home solution from blueprint to bluetooth! We work with some of the best craftsmen in the Valley to make sure your Smart Home meets your standards and exceeds your expectations. Home media specialists not only can design the seating and decor for your dream home theater, but most of them can help you find specific media control options, conceal your television and various accessories, set up optimal seating, choose and install ideal lighting, and help create the ultimate viewing environment. Some of these Arizona professionals work entirely on their own, while others work with subcontractors to get the job done. Here are some related professionals and vendors to complement the work of home automation & home media: General Contractors, Interior Designers & Decorators, Paint & Wall Covering Dealers, Furniture & Accessories, Specialty Contractors. Find a home media designer on Houzz. Narrow your search in the Professionals section of the website to Fountain Hills, AZ home media designers. You can also look through Fountain Hills, AZ photos by style to find a room you like, then contact the professional who designed it.